Cossette was founded in 1972 and is a division of the Vision 7 International network. Vision 7 International has 1,200 employees, including 700 at Cossette, with offices in Halifax, Quebec, Montreal, Toronto, Winnipeg, Edmonton and Vancouver. Named agency of the year in 2016 and 2017, Cossette is a fully integrated marketing communications agency that helps to "create meaningful connections between people and brands". Cossette operates in the creative industry and is often on the lookout for the latest technology. The company must therefore identify programs that integrate innovation and surpass the expectations of its employees, who have an average age of 30. With several offices across Canada, Cossette wanted to provide a national and bilingual service, which is why Dialogue stood out. Strong references and recommendations also facilitated the selection process. "In HR, we always seek out various innovative initiatives. We found that with Dialogue, people really saw the value for themselves. When we launched in Quebec and in the rest of the network, we had a very positive reaction, even a reaction of astonishment. I would say that this strongly encouraged us." Cossette advocates a culture of flexibility and trust in employees that contributes to job satisfaction. The company wants employees to use their time optimally and Dialogue allows employees to do so by avoiding long wait times at the clinic. "We know that all health problems do not make us bedridden all day. Sometimes, there are small issues and if we do not have an application like Dialogue, we want to go to the clinic, or we will consult a physician, but it takes us away from productivity, whether at work or in our personal life. It's a waste of time. 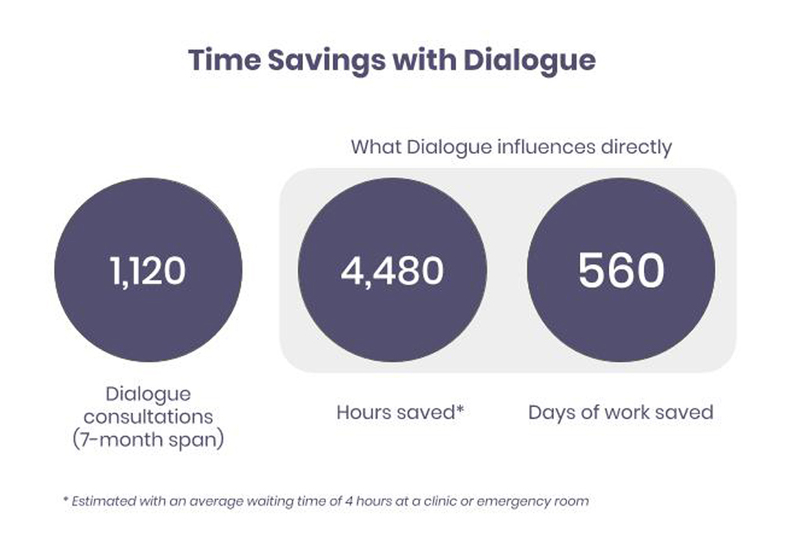 Dialogue’s telemedicine services allow people to manage their time well, and that's what's appreciated." Cossette employees work on prestigious, world-renowned brands in a creative environment, surrounded by innovation. Expectations for employee programs and technologies are high and Cossette wanted to align with the industry. "We wished to add a service that would be perceived as different and value-added. We are able to stand out as an employer in the innovation of benefits with services like Dialogue", says the Talent director. Following revisions to the group insurance plan, certain decisions were made at Cossette. Wanting to continue to offer a competitive employee program while being mindful of the budget, the Talent Director mentioned that by providing a service such as Dialogue, the changes in the overall insurance plan would be better received. Enhancing the traditional group insurance offer with Dialogue allows Cossette to continue to please employees while saving money. Group insurance is a basic expectation. Dialogue allows employers to add value to their wellness programs, while standing out with an innovative approach. Employees are skilled at managing their own time, which increases productivity and overall satisfaction, and reduces stress. The satisfaction rate with Dialogue is measured and reported regularly. The consensus is clear; Cossette employees are very happy with the Dialogue service and give a ranking of 4.75 / 5! Although there are several Cossette offices, talent and HR teams always make sure to talk about the Dialogue service. Some employees have even become informal ambassadors. Many communication tools are used (newsletter, internal forum, employee meetings) to remind employees of their access to the service, to share global usage statistics (without ever compromising the confidentiality of data) and to reinforce the availability of other well-being initiatives. Follow Cossette’s lead: offer your employees Dialogue to stay on the cutting-edge of technology, to help your employees better manage their time, and to save on the health-related costs of your business. Book a demo with us today to see how we can help.